The Revenue Commissioners are in charge of collecting the payment and have powers to chase those who attempt to avoid it. How does LPT affect employers? Householders can opt to pay their Local Property Tax (LPT) in one single payment or to phase their payments over the period January to December. One of the phased payment options being made available is deduction at source from salary or occupational pension. If this option is selected, payment will be spread evenly over the period 1st January to 31st December. The amount of each instalment will depend on the number of salary, wages or pension payments the employee is due to receive in this period. The householder/employee cannot choose when the deduction starts. The employer must follow the instruction on the Tax Credit Certificate (P2C) issued by Revenue and is required to start the deduction from the next pay period after the date of receipt of the P2C. Once the LPT deductions commence, the employer is obliged to continue the deductions and spread them evenly over the remaining pay days in the year. The employee cannot request that the employer pause the deduction, nor can the employer make this decision either. Employers must collect the total LPT liability for the year by spreading it evenly over the remaining pay dates in the year. LPT cannot be deducted in any pay period for which the employee is not in receipt of payment. However, once salary payments resume employer will have to adjust the amount of LPT being deducted to ensure that the total liability is paid by the end of the tax year. This will result in a slight increase in the amount of LPT being deducted from the remaining salary payments in the tax year. Schedule of deductions from 01st January to 31st December for monthly paid employee. Employee resumes work and payment from 01st September to 31st December, LPT must be adjusted for period of no deduction. Once an LPT deduction instruction is issued to the employer to commence LPT deductions from an employees payroll an employee can arrange an alternative payment method with Revenue if they wish.This can be done by accessing the online filing system using your Property ID, PIN and your PPSN, or by calling the LPT Helpline on 1890 200 255. 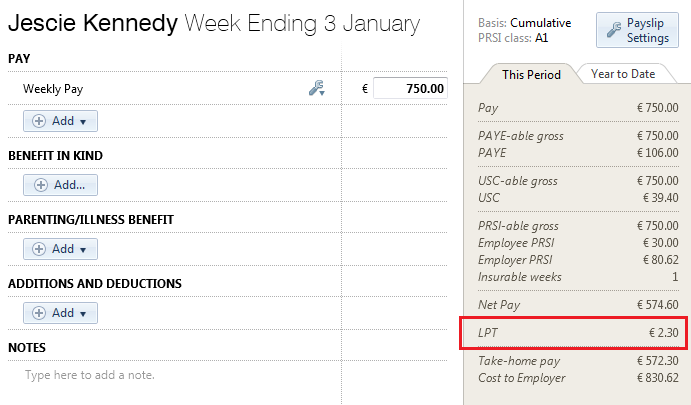 To establish how much LPT an employee/householder still has to pay for the tax year, the amount of LPT already paid by them through their wages (as confirmed on the payslip) should be subtracted from their total LPT liability for the tax year (as per P2C). Once the new payment method is confirmed, Revenue will send an instruction to the employer to stop deducting LPT for that employee by issuing a new Tax Credit Certificate (P2C). If an employee elects, or is compelled, to make the LPT payment as a deduction from salary Revenue will issue an instruction to the employer informing the employer of the annual deduction of LPT for that tax year. The Revenue instruction is in the form of a Tax Credit Certificate (P2C). If you are importing your P2C from ROS, the LPT Revenue instruction will automatically import for each employee to which it applies from the P2C file. No further action is required by the employer. 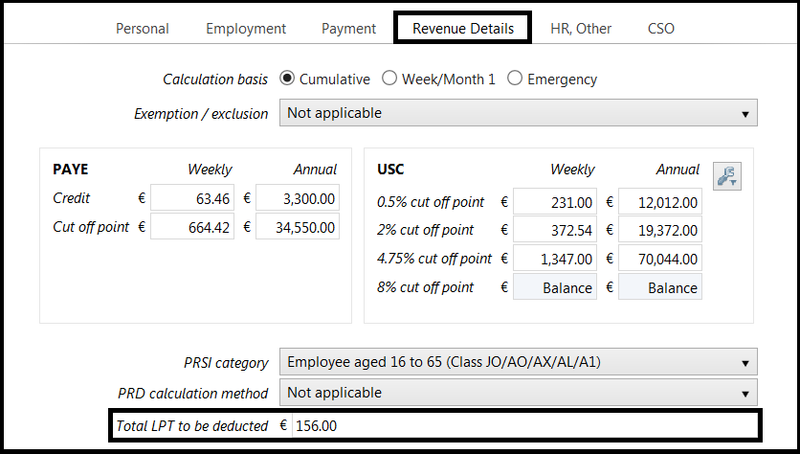 When processing the employees periodical pay BrightPay will automatically spread the annual LPT deduction equally over the remaining pay periods. If an LPT deduction commences after 01st January (new employee commencing after 01st January) the annual LPT deduction will be spread over the remaining pay periods. If there is a pay period in which the employee is not due salary and is processed with a zero payslip then the outstanding amount of LPT will be adjusted accounting for the zero pay period and spread evenly over the remaining pay periods. 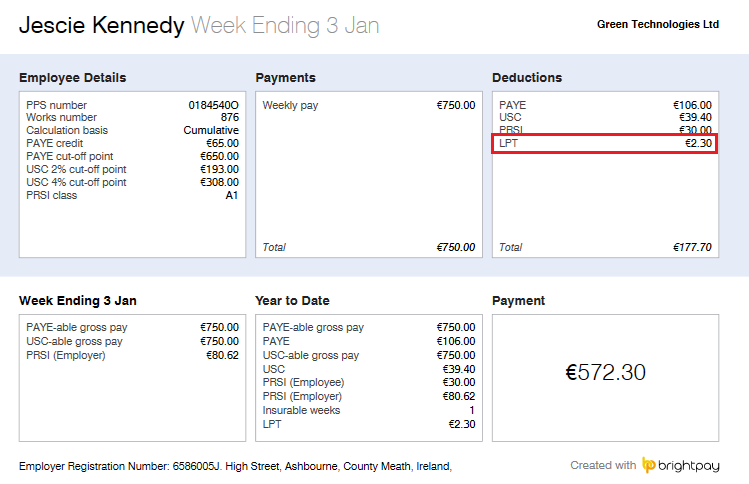 Any adjustments required to the LPT deduction due to unpaid pay periods etc are automated by BrightPay. No manual adjustment is required. Details of the LPT deduction must be recorded on the payslip to give a statement of deduction to the employee (as per the example below). Where a Court Order is already made at the time of issuing the P2C (advising LPT deduction) the Court Order will take precedence over the LPT deduction. If the Court Order is made after the P2C (advising LPT deduction) has issued, the LPT deduction will take precedence. LPT takes precedence over all non-statutory deductions.